On occasion, I get called on the carpet for things that my Agents have done, or have allegedly done. 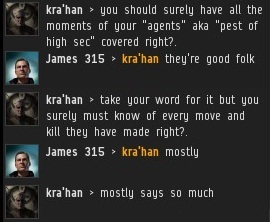 I am proud to say that after all this time, and with hundreds of Agents of the New Order deployed throughout highsec, not even one single incident of abuse has ever been substantiated. A lot of heroic deeds have been substantiated, though. Despite the honour and uprightness shown by me and my Agents, there are vigilantes out there who threaten to take matters into their own hands. This is where my Invincibility comes in handy. 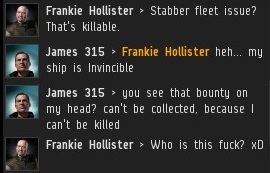 I purchased my trusty Invincible Stabber back in June 2012, shortly before I founded the New Order. Its shields have never been penetrated. Day by day, a ludicrous bounty has grown, but has never been collected. Anyone who has ever attempted to bring order to a lawless place knows what it feels like when the natives turn against you. They gather around and get that murderous look in their eyes. 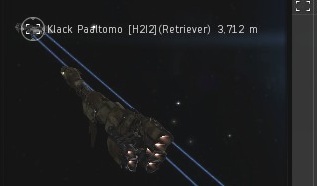 Fortunately, highsec carebears don't come from a hardy stock. They are incapable of standing up to an Agent of the New Order who shows that he hasn't lost his nerve. With the threat having past in record time, I indisputably held the field. 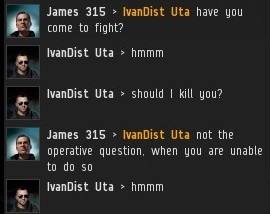 I was able to freely enforce my will upon my enemies. Propelled by madness, some of my enemies attempted to challenge my control of the system. 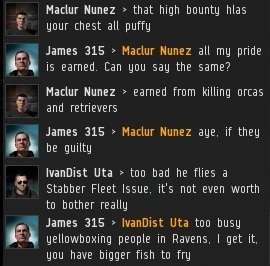 IvanDist Uta and Frankie Hollister brought a Raven and a frigate to give me the carebear stare. The history of the carebear stare is a long one. It was the subject of one of my very first posts on MinerBumping. It's a tactic that gets tried a lot, but it has never worked on anyone, anywhere, ever. If someone starts yellowboxing you, just stare right back at them, and wait for them to leave the battlefield in shame. Some people will give you the carebear stare for only a few moments before they give up. Some will stare at you for hours. But it always ends the same way. 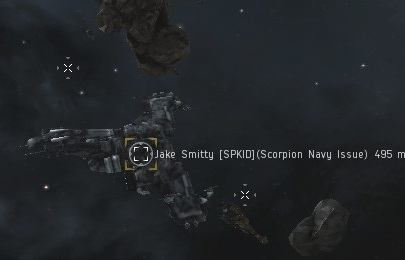 Shortly after IvanDist and Frankie left, Jake Smitty took to the asteroid belts to yellowbox me in his Scorpion Navy Issue. 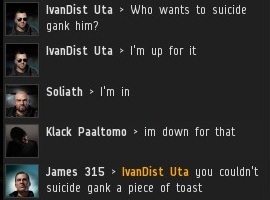 Because a suicide gank by a faction battleship is a real credible threat. 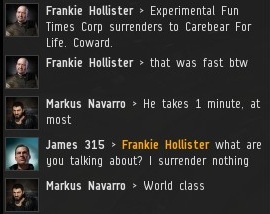 When Frankie realized that he couldn't stop me from bumping by locking me in a frigate, he decided to take the plunge: A full-scale wardec against my one-man corp. In no time at all, I had won the war. That's nine straight wars I've won now. My enemies had no choice but to concede. I am reminded of what Winston Churchill once said: "You have enemies? Good. That means you've stood up for something, sometime in your life." 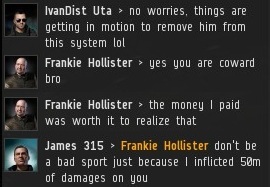 The New Order stands up for the Code, and stands against the bot-aspirants and bullies of highsec. They have always said that our defeat was right around the corner. Yet they have been unable to stop us, no matter how many yellow boxes they light up. This blog has recounted the numerous was James has won and how he did it. Carebears are just not capable of doing any intel. 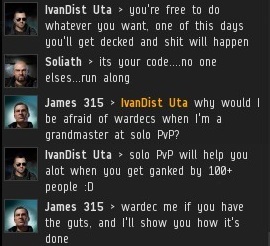 Oh except that one guy who paid millions of isk and ganked with us to find out our super secret tactics (hint: check the links at the top boys) . That guy was a genius and the rebels need more like him. 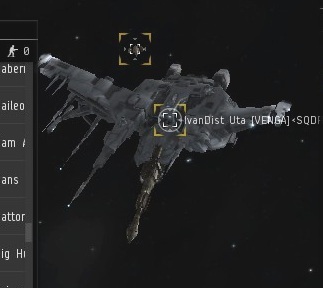 A wardec on an one man corp aside from a coward move means an instant, shameful and irrevocable defeat. Funny I always thought James315 was an American? thats great bob, that youre trying new things! 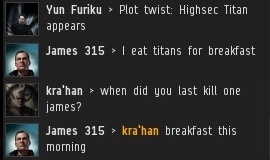 "I eat titans for breakfeast." 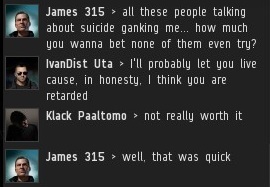 - "When did you last kill one James?" - "Breakfeast this morning."